Congenital Heart Defects (CHD) are a lethal constellation of birth defects, of the heart, that affects millions of new born infants and children worldwide. Eight of every 1000 children born alive will have some form of congenital heart defect. We must raise awareness of the need for funding for research because CHD is the most common birth defect. (According to the Children’s Heart Foundation). Show your support for CHD Research by wearing this Support CHD Awareness T-Shirt. Our CHD Awareness T-shirt is a great way to show your support. This Sudden Congenital Heart Defect Awareness Shirt is available on 100% cotton preshrunk t-shirts, machine washable in youth sizes XS-L and adult sizes S-3XL. Free Personalization is included! We will personalize the front of your t-shirt with any name in the blue heart & the back of your t-shirt with any three line custom message. Wearing our shirts proudly for our daughter's open heart surgery. Shirt turned out great! We love it!! Additional Info Our number one goal is to help create awareness. Shop MyWalkGear.com for all of your Awareness Apparel & Walk Gear. 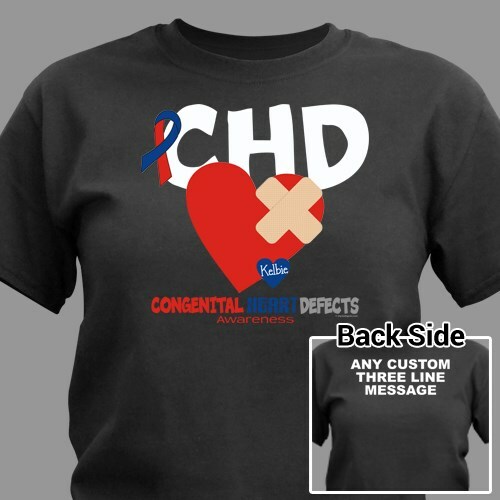 Be sure to also view this great design in our CHD Awareness Sweatshirt & our CHD Awareness Hat as well.